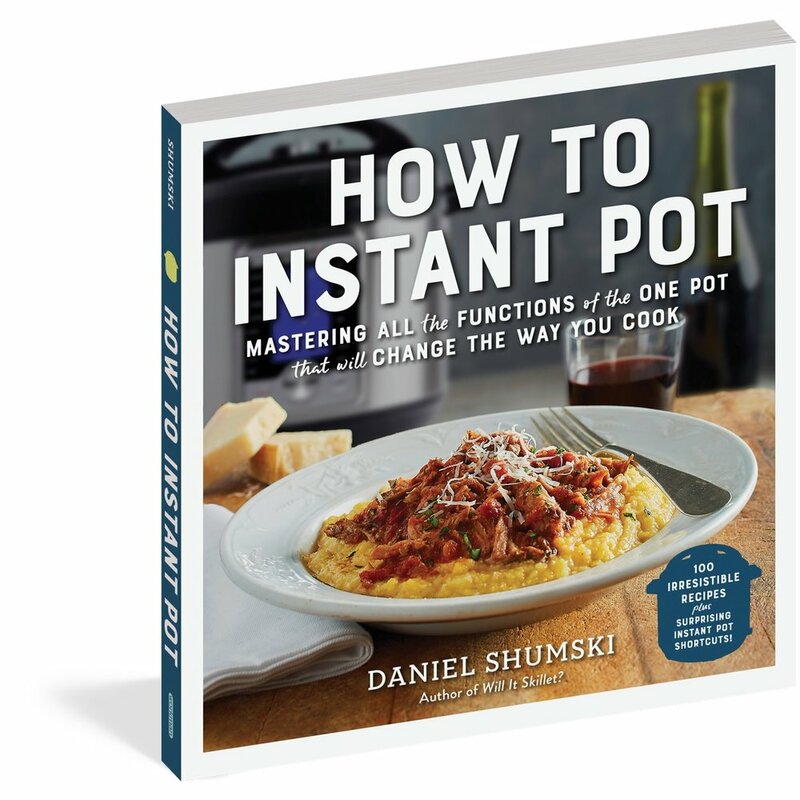 A bonus recipe to thank you for getting my new book, How to Instant Pot. You do have it, right? Making this stew in the Instant Pot takes advantage of the sealed, high-pressure environment to quickly tenderize a tough cut of meat. Adding a little balsamic vinegar with the onion as it’s sautéed allows the sugars in the balsamic vinegar to caramelize. That flavor is then blended into the stew for a subtle depth of flavor. The best part? All of this is happening in the Instant Pot — no extra pots or pans to worry about and no flavor wasted. 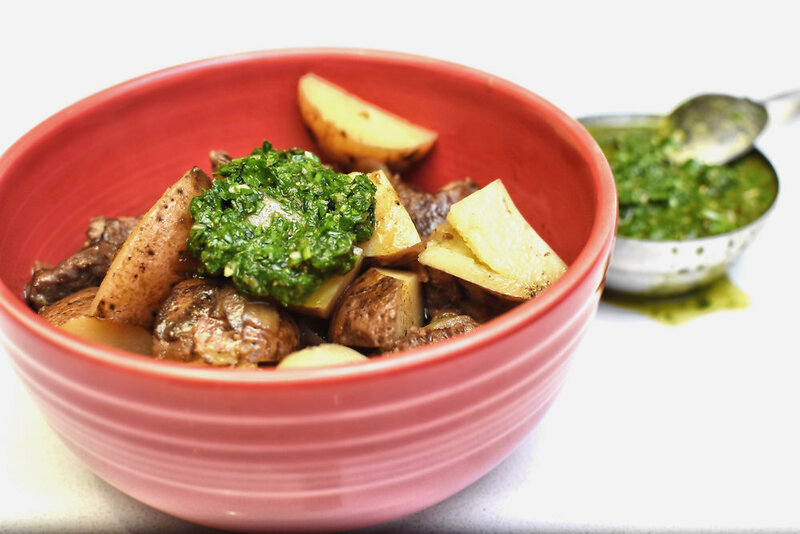 Now, that sauce: Chimichurri sauce — a South American condiment typically served with grilled meats — brightens the flavor of this favorite fall comfort food. Can you add more garlic to the chimichurri sauce? Absolutely. But start with half a clove and taste the sauce before you add the other half. Once it’s in, there’s no taking it out. Place the flour, salt, and pepper in a large bowl and stir to combine. Add the beef and toss with the flour mixture until the beef is evenly coated. Set aside. Press Sauté and select the middle temperature (“Normal”). Place 1 tablespoon of the oil in the inner pot, wait about 2 minutes for the oil to heat, then add the onion, thyme, oregano, and balsamic vinegar. Cook with the lid off, stirring occasionally, until the onion softens slightly, about 5 minutes. Use a large spoon to remove the onion to a bowl; set it aside. Place the remaining oil in the inner pot, wait about 1 minute for it to warm, and then add the beef. Cook with the lid off, turning the beef occasionally, until it is browned on most sides, about 5 minutes. Place the broth in the inner pot (be careful—steam may whoosh up!) and use a silicone spatula or wooden spoon to scrape the bottom of the inner pot until most of the brown bits are released, about 1 minute. Add the reserved onion, potatoes, carrots and Worcestershire sauce and stir to combine. Close and lock the lid. Set the valve to Sealing. Press Cancel, then press Manual or Pressure Cook and select High Pressure. Set the time to 20 minutes. Meanwhile, prepare the Chimichurri Sauce. Remove the lid and taste the stew for seasoning, adding salt and pepper as needed. Serve hot, garnished with dollops of Chimichurri Sauce. While the stew cooks, puree all ingredients in a food processor. Transfer to a bowl and garnish stew before serving, reserving some sauce to add at the table to taste.